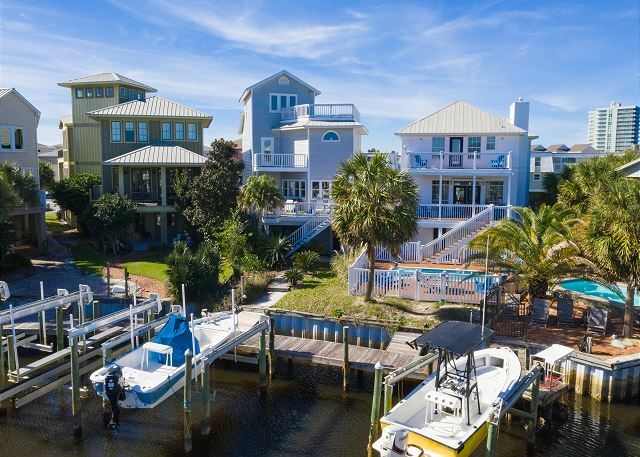 WATER ABOUNDS: Located directly on Lafitte Cove, a protected waterway, this fun and relaxing home has a private boat slip and new private pool. 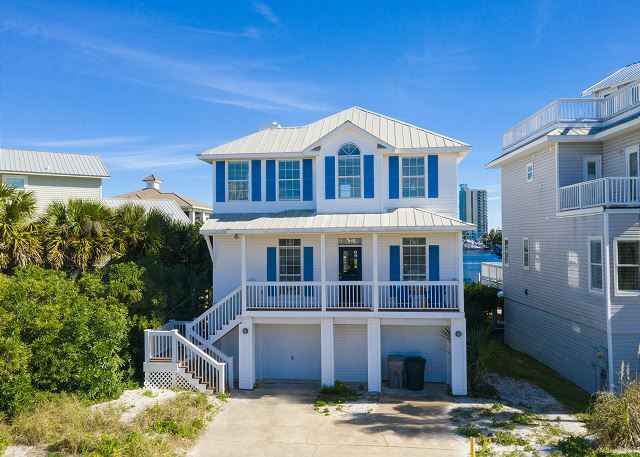 The beautiful emerald waters and white sand of Pensacola Beach are less than a two-minute walk to the south of the home; and the calm waters of Santa Rosa Sound are just steps to the north. 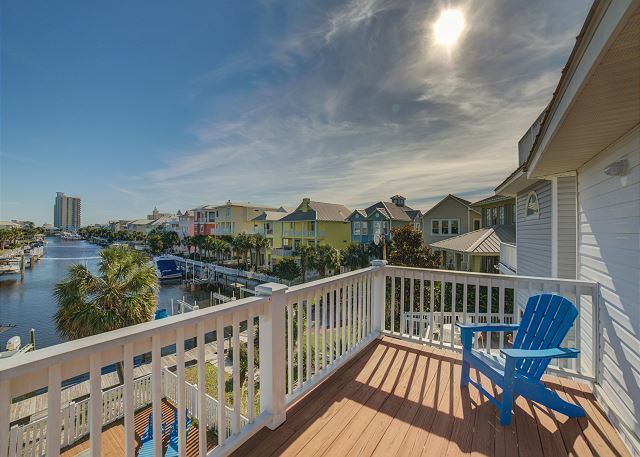 The master bedroom has one king bed, private bath, and private deck facing Lafitte Cove. The second bedroom has a queen bed and a twin bed with views of Santa Rosa Sound. 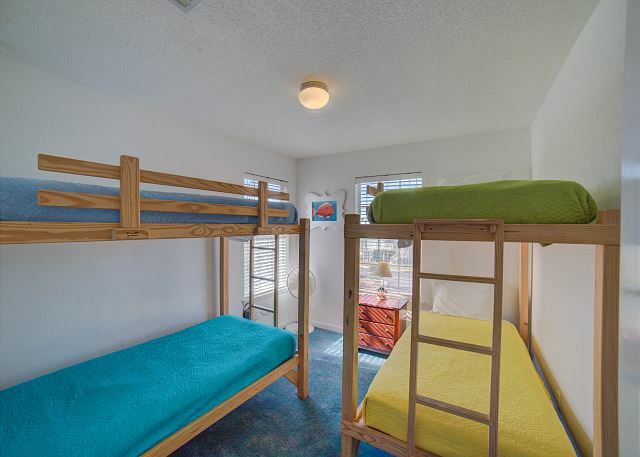 Bedroom 3 has two sets of bunk beds, ideally suited for children and teens. A sleeper couch is in living area; and off the living area, the large covered deck overlooks the pool and Lafitte Cove. The home welcomes friendly canine family members under 30 pounds with pet fee. Whether a beachgoer, sunbather, boater, diver, or kayaker you will find your stay exciting, enjoyable and relaxing. We enjoyed our trip very much. The house was in a great location and we had plenty of room. Everything was great, but there was some of the lights in the back that we could not get to turn on. Overall it was terrific. My family and I spent the first week of April at 258 Le Starboard and we had an incredible time! The home perfectly accommodated my family's needs. 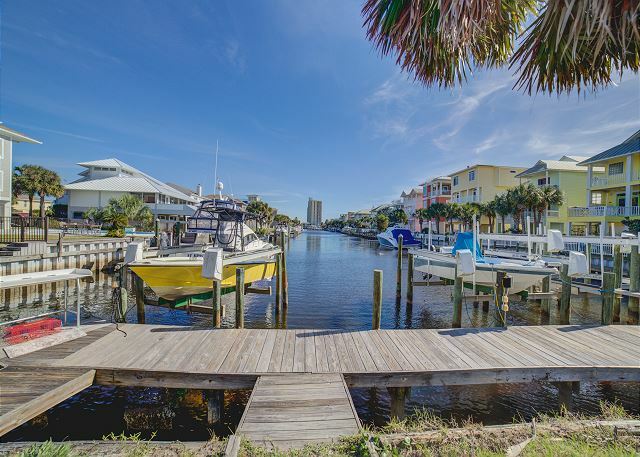 Location was ideal...beach access is a very short walk, as is Peg Leg Pete's restaurant. The neighborhood is high-end and quiet. Great time had by all! 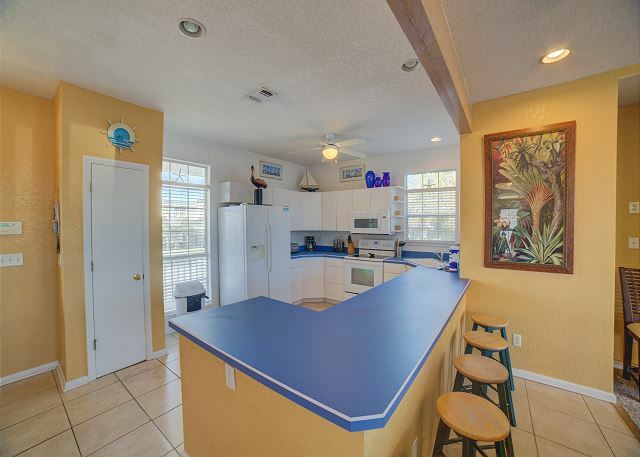 Great family friendly vacation home! We had a great time! 4 adults and 5 kids and we had plenty of room. Excellent location! We will definitely rent this house again. The beach house was far beyond my expectations. Perfect location, very short walk to beach, and a pool. We had 7 adults and 7 children, and never felt crammed or closed in. I will definitely stay here again on our next family trip. Beautiful home, great location overall a pleasant stay. Positive experience while staying at 258 Le Starboard. Could have had more TP, laundry and dishwashing soap. I personally had to repair main bathroom door as it was falling off the hinges and would not close, exterior door locks need adjusting also. 3 families yearly vacation. Only complaint s would be back door needs adjusting,needs more dish towels in kitchen. But overall great place !!!! We lived in GULF Breeze and after the BP Oil Spill a job transfer took us to Oregon. After 5 long years we were able to come home and decided to move back. Staying here made us realize what we were missing. Thanks for the great time...2016 is starting off Awesome! Had a fantastic vacation here. My wife and I brough out two young kids and my parents joined us from the UK. So there were 4 adults and 2 kids total - and we had ample room. 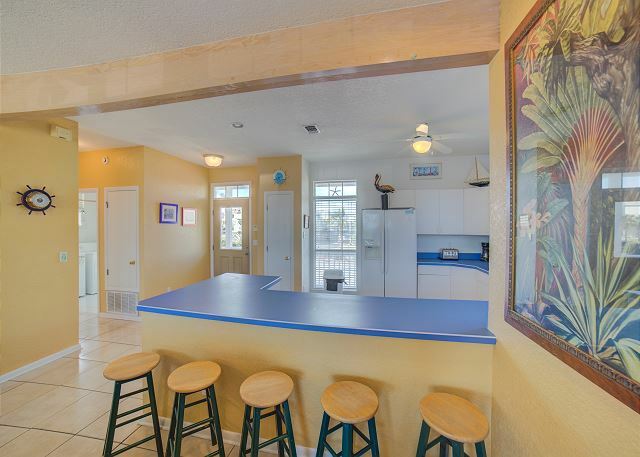 This house is all about the location, perfect spot, such a short walk from the beach. The pool really is a great bonus, perfect for the kids, but with a good security gate. The house itself is open and bright, but could probably use a little updating. Kitchen was pretty well equiped. Management was very responsive to the few small issues we had (lights out) and had things fixed quickly. Make sure you walk down the canal to Peg Leg Pete's, good sea food and drinks. Great location. Enjoyed the pool and boat dock. Brought our boat from home which gave us an opportunity to visit many beaches/locations we would not have gone to otherwise. My trip to Pensacola beach was awesome. I really enjoyed having a private pool. And really appreciated the pool accessories and toys for the 3 year old that was in the garage. We have never rented a house before. We usually only stay at hotels, but since our children each brought a friend it just made more sense to try a house. We really enjoyed staying in the house and it was a peaceful neighborhood. We were kind of caught off guard having to buy everything for the house. From trash bags to toilet paper, you simply have to purchase everything. However, we will know next time. Great stay. This place was everything included in the photos and more! My friends and I stayed here over our spring break and had a fantastic time. The private pool was great for lounging during the day and beach is right across the street! It's located about a mile and a half from the bars and restaurants so it gives a nice secluded feel but yet close enough to the action. The view of the sound is amazing. Loved the location of this property. Being on the sound is so serene that you feel a million miles away from the hustle and bustle, but the boardwalk is within walking distance. The pool is a real bonus and the beach is just a couple of houses away. 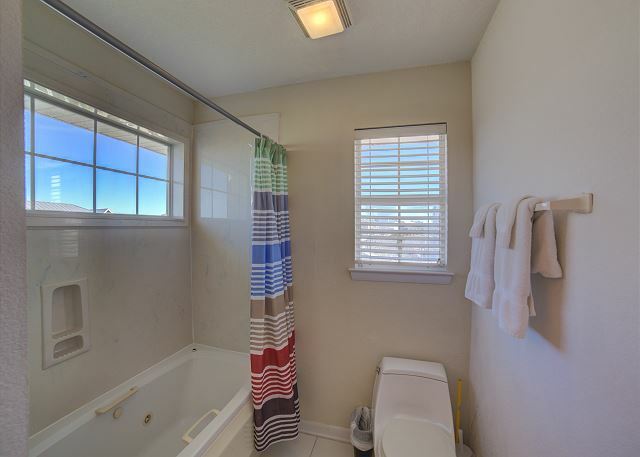 This property is not the most updated, but it is adequate and spacious. Great time, great house, kids loved the pool, great place to dock boat, close to everything including Gulf and sound, needs new vacuum. Thank you to everyone at Paradise for being so attentive to our needs and making our experience one we will never forget.